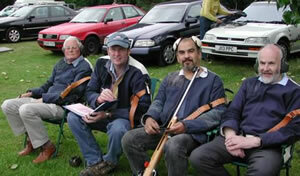 Just as with England’s national sports teams, the Old Frams, high on expectation reverted to type in the inaugural Lizard Cup on 5 June at Bisley and displayed heroic failure against the Auld Enemy. Exhilarated by sweeping victories against all-comers in the 2004 shooting season, our happy band of brothers experienced a slump in form to allow the Laurentians to rescue some respectability from their season. The normally tirelessly superior Old Laurentians lifted the sumptuous silver trophy adorned with an enamelled gecko – acquired especially for the purpose by skipper Bullets Burnip on a business trip to Mexico - by 11 clear points following the gruelling Leo (Sayer – all-dayer) shoot at Bisley. Yet, as if to remind the world what English stiff-upper lip is about, Bullets was too sportsmanlike to bring to mind the Lawrentians’ rather distasteful deed of issuing a three-line whip to their alumni and summoning proper shooters to their cause, including long-serving Great Britain team member Chris Thompson. Thompson then opened his account at 900 yards by effortlessly slotting a maximum 50.5 in tricky conditions. However, lacking the captain’s finesse, team yobbos Steve ‘Liberace’ McDowell and Hon Sec James ‘Driller Killer’ Mehta were quick to spoil the sedate atmosphere of a sunny Stickledown range with a loud accusation that the opposition had been blatantly cheating. But the OL skipper’s protests were immediately silenced and a confession forced that it was true; they had, in fact, been practicing. Sadly though the OF appeal to the committee was rejected on the grounds that there isn’t one. Nonetheless, the OFs soldiered on as the unusual format of the competition unfolded – 900 and 1,000 yards followed by 300 and 600 yards – as we welcomed the rare sight of Geoff ‘We have a problem’ Houston and son James onto the range. Bullets fixed the 900 target with his usual steely eye and set the Frams off to a solid start with 49.6. John “Nicarette” Halahan followed with 49.5 and even McDowell, semi-conscious from a double of jet-lag and a late-night pre-Derby dinner, managed a jammy 48.1 despite spraying shots about more randomly than Emile Heskey. The normally reliable ex-Atheling Hon Sec, however was enmeshed in a man versus machine tussle all of his own. Despite the recent acquisition of a state-of-the-art target rifle so expensive that the Mehta family annual holiday is now a barging weekend on the Manchester Ship Canal he did not score as freely as usual. Guilt, obviously, muttered the more unkind members of the team. Ungainly as a pantomime horse, the team ventured on through a highly tricky fishtailing wind at 1000 yards, and with relatively few disasters, and a good showing from Nigel “Vorsprung” King – fresh from viewing Venus through his shooting glasses - we headed to the shorter range with confidence. Then at 300 as so often can happen to the unwary, horror struck, McDowell – lack of sleep and too much Rioja taking its toll of his already feeble powers of concentration – and Mehta still struggling to find synergy with his space-age shooter, they returned sheepishly from the firing point having scored only 83.5 between them. Easy points dropped and the OL’s Thompson potting more bulls than a matador conference. As the team trudges back to 600, the tension is palpable – Horton Maximus and Brian ‘Antepost’ Smith have scored reasonably at 300 but it is not enough - we are well behind. Halahan nervously chain-sticks nicotine patches. Sadly at 600, even with improvements from all - Mehta finally mastering machine to hit 47.3 and another 49.6 from Halahan, we know it isn’t enough. The OL’s have surely taken the cup.